Looking for a new Southeast Asian recipe to add to your regular rotation? Want to mix it up a bit from the usual red and yellow Thai curries with chicken and pork? 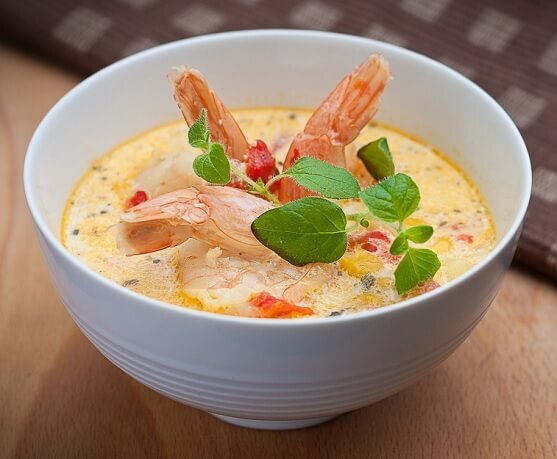 Try out this Cambodian Coconut Shrimp soup for a bit of a twist on your favorite flavor profiles. Lemongrass, ginger, turmeric, kefir lime leaves, and a host of other authentic Cambodian flavorings come together to bathe delicate shrimp in a warm bath of delicious, bright flavor. You’ll love it! Fresh is key to this recipe. While you may not be able to get still live shrimp, everything else can be bought fresh. Cambodian food will feel like Thai food but should be less hot and have more subtle flavors overall. It’s a quick meal but takes multiple steps and items to make it properly. Keep that in mind.